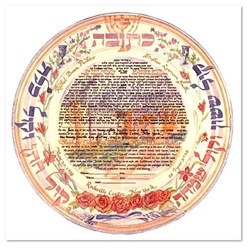 Round Jerusalem 19" x 19" (Lithograph) - Conjuring up images of elation and dance are the words "It shall be heard in the cities of Judea and in the streets of Jerusalem, the voice of joy and the voice of gladness, the voice of the groom and the voice of the bride." Sivia has created original Ketubot, special commissions and calligraphic watercolors since 1972. Her paintings, based on Hebrew texts, combine the subtlety of contemporary color and design with the warmth of nature and the lyrical grace of the Hebrew letter. 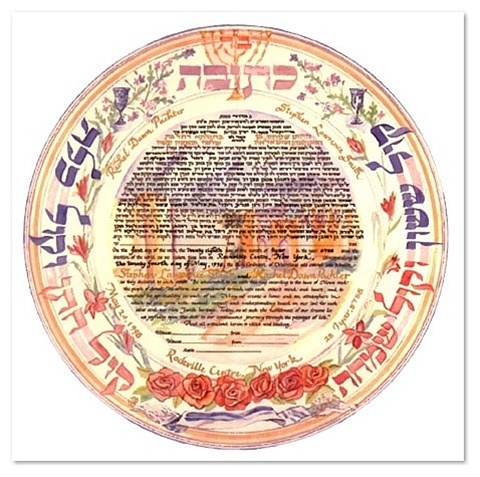 Her works have been presented to former President Jimmy Carter as well as congregations, Rabbis and community leadersand have been exhibited in museums and galleries throughout America and Israel.